Whether she was spinning confessional tales of romantic heartache during her college years, collaborating with her husband Drew as part of his band, Drew Holcomb and The Neighbors or penning her personal reflections of God’s faithfulness as a solo artist, singer/songwriter Ellie Holcomb has always viewed music as the ultimate bridge-builder. Inspired by God's Word, Ellie recorded and released two EPs full of songs based on the Psalms and other scriptures, Magnolia EP and With You Now. Even with zero dollars spent on promotion, the response to these two EPs was remarkable in a way Ellie never saw coming. To wit, they both hit #1 on the iTunes Christian/Gospel charts. 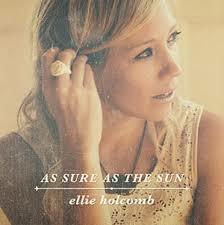 After releasing both EPs Ellie says that she “cried joy tears for about a week just dreaming about how God would encourage people through His word in the songs.” Now with Holcomb’s first solo effort, As Sure As the Sun (Full Heart Music), Scripture is, once again, intentionally at the forefront of all 10 tracks. Written before—and while—Ellie was pregnant with her daughter, Ellie says her hope is to refresh and encourage weary and wounded hearts. Whether it’s the beautiful reminder of how God’s mercies are new every morning in the title track, the emphasis on being truly known, warts and all, and truly loved by God nonetheless in “Marvelous Light” or the enduring promise of how God turns our weeping into dancing in the aptly titled “The Broken Beautiful,” Ellie’s clear vision for uplifting the weary and wounded who need a reminder of who God is—and how He loves them—has already been connecting on a deep level.